Farewell Google Reader. Hello Feedly! Many of our customers enjoy the ability to integrate with Google Reader to aggregate their RSS and social content in a single place. Being able to share all that content right in Sprout is a huge time saver and functionality that our users have come to love and appreciate. So, many of you were likely disappointed to hear that Google will retire its RSS reader service on July 1st of this year. Well fear not! We are excited to announce a partnership with Feedly as our official replacement for Google Reader RSS service. 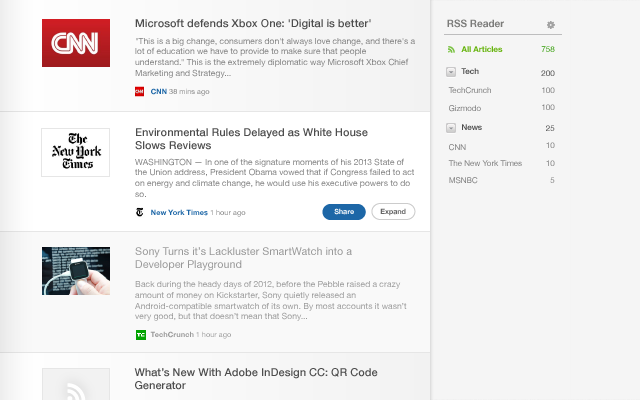 Feedly has a strong reputation for building solid, well designed tools for content aggregation, which makes Feedly an excellent platform to keep RSS functionality inside of Sprout. Here’s what you need to know for a seamless transition. Our integration with Feedly is live as of today and getting setup is easy. You’ll need to create a Feedly account or connect to an existing Feedly account. Feedly will do all the heavy lifting of migrating your existing Google Reader subscriptions to the Feedly platform. Once your new Feedly account is setup and successfully connected, Sprout will continue to give you access to your Feedly-driven RSS content for your sharing delight! We discontinue support for Google Reader on July 1st. Please make sure that you sign-up for Feedly prior to Google’s retirement date for Reader for uninterrupted service.